Continuing with presentations at Building Business Capability, Kaiser Permanente and IBM presented on their decision management and cognitive platform for application development innovation. For those of you that don’t know, Kaiser is the Nation’s largest not-for-profit health plan. They do everything from inpatient, to home health, hospitals, hospice, pharmacy, and insurance. 10M+ members, 17,000 doctors and nearly 200,000 total employees. IBM has been working with Kaiser for a while on their decision management journey. Thisd began with SOA infrastructure they first added BPM before adding in-context Decision Management to automate decisions. More recently they have begun to focus on predictive analytics, on cognitive services and on event-awareness and event processing. Most recently they begun to focus on decision modeling as a way to frame and structure their business rules and support analytic and cognitive development. They are using IBM’s BRMS Operational Decision Manager (ODM). They are also, it should be noted, a Decision Management Solutions customer. 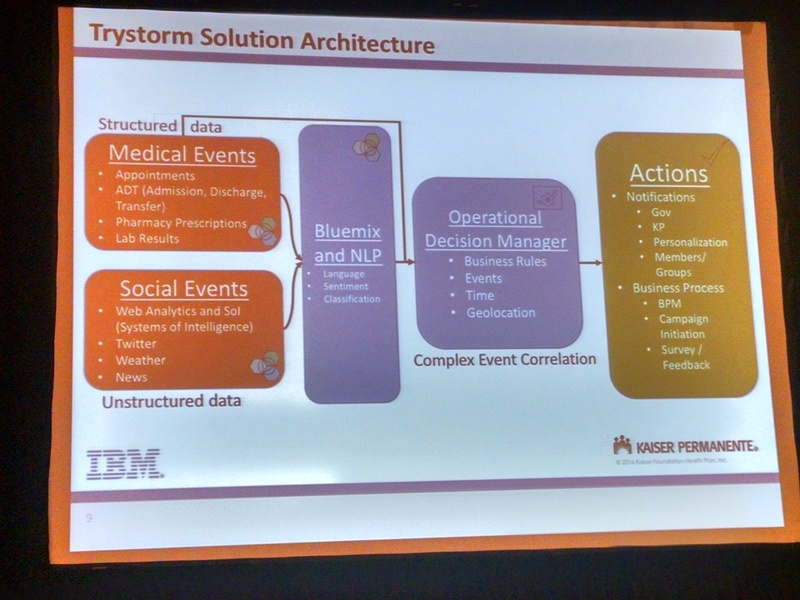 Kaiser works with IBM on try-storms. These are brainstorming sessions involving Kaiser and IBM teams that result not just in ideas but in working prototypes based on technology from business rules to predictive analytics, complex events to cognitive. These sessions illustrate the value of the technology, rapidly identify scenarios and projects that could use it and help internal customers understand the potential. Two scenarios are going to be shown – member-centric notifications for health scenarios and fighting the flu with cognitive. These scenario use as conceptual architecture involving rules and cognitive decision-making against traditional and newer data as well as events. The first demonstration discussed notifications. Often notifications are too generic, too late and too hard to target/change. The new approach leverages SOA and messaging to pull the right data, Decision Management to control the formatting and content, and cognitive services to handle unusual data. For example, consider air quality – data managed by The Weather Company – and how that might affect notifications. The demo began by showing the rules for a decision and how they can be configured by business owners. The business user can set up a simulation to see how a particular metric is met by the current rules. This allows them to baseline the rules to see how they are working. If that’s not working they can navigate to the rules for their decision – in this case as a decision table. For instance, the severity level of an air quality level that results in messages could be changed to increase or decrease the number of warnings issued. The new rules can be re-simulated to make sure the result is what was expected. This was a very rule-centric demo. The second demo focused on detecting flu outbreaks. If this could be done, Kaiser could use rules-based decision management approaches to launch processes, alert people etc. This involves using event processing to detect and leverage structured events such as admissions or prescriptions. The event is an admission related to something epidemic (rather than scheduled, say). Then a rules-based decision checks to see if that was a flu admission. The event processing engine consumes events about flu admissions and checks to see if there have been a cluster of flu admissions in a time window and issues a notification. These get aggregated from hospitals to counties to drive alerts back down to other hospitals in the county. This can then be combined with more predictive technologies. In this case, there are precursor symptoms that people experience before going to hospital. Tweeting or otherwise updating social media with these symptoms gives possible predictive data. Using Watson sentiment analysis one can analyze the social posts for tone (am I getting more sick and so more miserable) as well as for content including symptoms (not just mentions of the flu). To make this work a set of Bluemix services are tied together to collect social media data using APIs, check the language and find the sentiment of the language. Another service is then used to classify the content as either about flu symptoms or not. This last was trained using a whole set of phrases that do describe symptoms and others that talk about the flu but not about being sick (such as tweets about epidemiology or CDC announcements). See this post for some details on Watson’s cognitive services. These alerts are great but to be valuable, rules-based processing has to use this to take some kind of useful action. In this case the flu social media tracking was combined with other data to start predicting that admissions will rise soon in a particular area, allowing hospitals to see where they might need to prepare for flu admissions. The events being captured can also be analyzed geographically, allowing the movement of an epidemic to be predicted. This creates a layer of events – predicting flu is coming to an area, identifying people in an area talking about having the flu and ultimately getting admitted. The rules-based event engine can use this to trigger increasingly precise and useful actions. A nice example of a rules-based infrastructure with a layer of analytic/cognitive enhancement. David wrapped up with a pitch for decision modeling, using the Decision Model and Notation (DMN) standard, as a way to exploit these decision-making technologies by engaging the business in configuring and designing the decision-making to be automated. Don’t forget that David and I are speaking later in the week too with more on decision modeling. Next post: BBC 2016: We got the Funding for Maturing our Business Rules & Process Management Capabilities – Now What?